ACTON – Five people were injured Tuesday in a crash involving a car, a camper and an overturned tanker truck carrying about 2,600 gallons of propane, which forced the closure of the southbound Antelope Valley (14) Freeway in the Acton area. The collision was reported about 9:15 a.m. Tuesday, April 9, on southbound SR-14 near Crown Valley Road, according to the Los Angeles County Fire Department. The southbound freeway was closed in the area, and a hazardous-materials team was sent to deal with leaking propane. According to the California Highway Patrol, at least some lanes were expected to remain closed past noon while crews worked to clear the scene. According to a California Highway Patrol report, three vehicles — a 1979 Beaver Motorhome, followed by a a 2013 Toyota Yaris, followed by a 2009 Peterbilt truck loaded with 2,500 pounds of propane — were traveling southbound on SR-14 in the No. 3 lane. The motorhome experienced mechanical problems and its driver slowed down and started pulling on to the right shoulder. The Yaris also slowed down and pulled to the right, directly behind the motorhome. The tanker truck was unable to stop behind the two slowed vehicles, and the truck veered to the right, crashing into the back of the Toyota Yaris and pushing it out of the way. The tanker truck continued forward and collided with back of the motorhome before overturning on the right shoulder, according to the CHP report. “As a result of these impacts, the 2009 Peterbilt propane tanker started releasing propane,” the CHP report states. 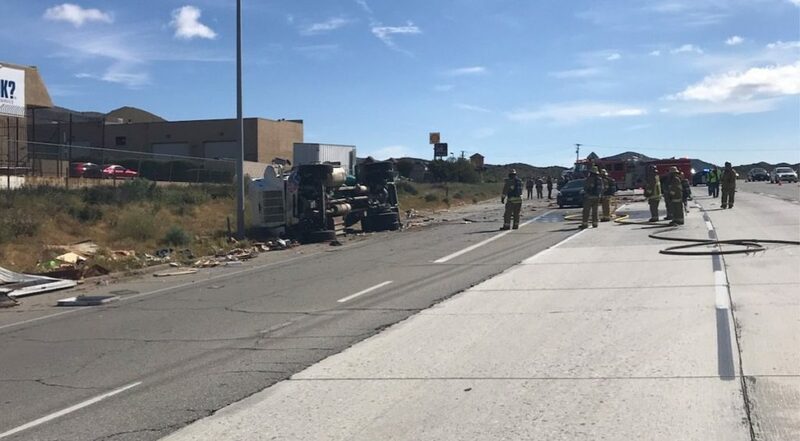 The tanker truck’s driver, 37-year-old Russell Miller of Tehachapi, sustained moderate injuries and was transported to Antelope Valley Hospital. The motorhome’s driver, 21-year-old Yazmine Marie Gomez of Garden Grove, sustained moderate injuries and was taken to Antelope Valley Hospital. Her passenger, a 12-year-old from Long Beach, also sustained moderate injuries and was taken to Northridge Hospital. The driver of the Toyota Yaris, 41-year-old Dominic McCoy of Long Beach, sustained moderate injuries and was taken to Northridge Hospital. A passenger in the Yaris, 19-year-old Amanda Aguirre of Long Beach, sustained moderate injuries and was taken to Antelope Valley Hospital. Alcohol and drugs are not suspected as factors in the traffic collision, according to the CHP report. Southbound traffic was restricted to the center median following the collision. All SR-14 southbound lanes were closed until about 4 p.m. as a result of the propane leak, according to the CHP report. 1 comment for "Five injured in three-vehicle crash involving propane truck near Acton [updated]"
Once I saw 1979, I knew who was at fault.